The high critical rate the Thief enjoys is a very nice advantage, especially when combined with the speed of their dagger attacks. They aren’t built very solidly, however, with low vitality, strength and endurance stats making them a weak target and also reducing their weapon choices but they hold the highest dexterity of all other classes. 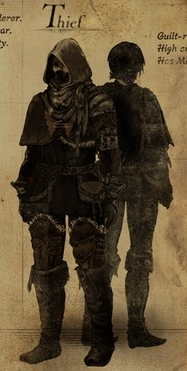 The dagger is capable of dealing with most enemies perfectly well, and compliments the Thief’s speed and evasive style. They also come with the master key by default, which allows them to select a different gift and access many locked doors much easier than other classes could.